This lesson introduces the concepts needed to understand and use ensemble prediction system (EPS) products. It describes basic statistical quantities and methods used to develop EPS products, such as probability distribution functions (PDFs) and cumulative distribution functions (CDFs). From there, it discusses ways of using EPS products compared to deterministic products. The final section briefly introduces nine common EPS products. The lesson is a prerequisite for the EPS Products Reference Guide. This lesson is very importance for learning difference between CDFs and PDFs and the some criteria we can follow when using EPS forecast information versus traditional deterministic information. Nice introduction to EPS. Not overly heavy...basic and helpful. I would like to have a more detailed description of the various acronyms used in the module, for example QPF. As a forecaster, understanding the differences in deterministic versus probabilistic model data is invaluable. This was a good course to review and improve basic understanding of the two, as well as for learning about products I hadn't used before. The basic statistical concepts were familiar to me so some elements were reinforcement / reminders of my existing knowledge. Format of the course was easy to follow and content accessible. Understandable, nice graphics and not too long.Perhaps some explanation of the 'Shift of tails' diagram would be handy? A good intro course. Tough but very informative. A bit basic, but it is an introduction. Similar information is readily accessible elsewhere, and there is nothing extremely informative here aside from the tidbits on CDFs. If you have any knowledge already, then you should be fine. I enjoyed understanding more about the considerations in working with ensemble forecasts. The quiz had several questions that seemed ambiguous to me. Could be useful to some people, but I think most NWS meteorologists are already familiar with the subject matter. Well designed lessons. I learned a lot form the classes. This is a good overview of EPS. However, I think the delivery of the statistics refresher could be improved to make it more apparent to the learner why a basic understanding of statistics is important to them. This would engage the learner and show relevance of the background information. 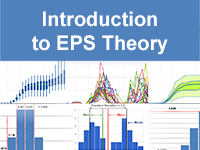 This lesson has a good introductory review of EPS theory. Thanks and regards from Spain! Such a module on eps theories was long overdue. It's somewhat basic, but important topics were definitely included! I liked how the different forecasting interpretation methods were discussed using statistics, weather maps, graphs, and their significance to the modeling. A lot of text and statistics. Audio/visuals may help. Also, introducing topics with an example of why it is relevant might help.